of Sauer & Sohn from the Suhl archives. Their book, Automatic Pistols of J.P. Sauer & Sohn: A Historical Study (also known as J.P. Sauer & Sohn, Volume II), is a landmark in the field. In the early 1920s there was a large market for vestpocket pistols and it was saturated with small, lightweight pistols such as the Walther Model 9, the Melior, and the Mann Pistol. At that time the Sauer & Sohn (S&S) Company was still producing its superb Model 1919. In 1924 or 1925 it introduced a new pistol which was called Westentaschen-Modell (WTM) in 6.35mm Browning, which was slightly larger than the Walther Model 9. Some collectors have designated it WTM 24, however this is an artificial name based on the most likely year of introduction. The original gun was simply referred to as the WTM. Unfortunately the WTM was of a rather complicated construction, so only about 8300 pieces were built. 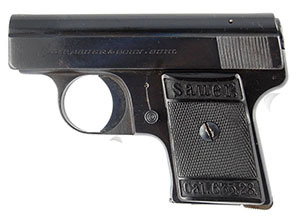 Then in 1928 Sauer & Sohn came out with a totally new simplified design, the WTM 28, which was of more or less the same size as the Walther Model 9, of which approximately 10000 were made. Advertisements of the era refer to it as the WTM 28. Later, in 1933, the WTM 28 was redesigned and offered as the WTM 33. One curiosity is that the grips of the WTM 33 still say 28. The WTM 33 pistols were built in very small numbers and are quite rare (approximately 1300 pieces). 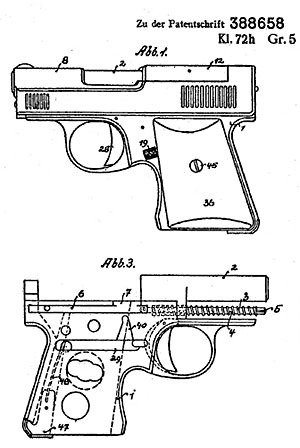 DRP 388658: Self loading pistol patent granted to J.P. Sauer & Sohn on 18 February 1924. This patent was granted for the construction of the slide with its removeable breech block, and also details the construction of the connector bar, safety, and recoil spring guide rod. The design of the recoil spring guide rod allows the gun to be disassembled without removing the recoil spring or unduly compressing it. The recoil spring is held in place by two small ears at the front of the guide rod so that it is always tensioned slightly. DRP 453654: Self loading pistol patent granted to J.P. Sauer & Sohn on 14 December 1927. This patent describes how the slide of the WTM 28 is fixed to the frame. DRGM 840519 was filed on 20 October 1922 and was closely related to the DRP 388658. It was used to establish patentable changes in the design of the WTM pistol. The frame was changed to allow easier removal of the grips, and the connector bar was altered. DRGM 840520 was filed on 20 October 1922, and is mentioned in the Sauer & Sohn WTM manual but we have no information on it. DRGM 860630 was was also filed on 20 October 1922 and is also mentioned in the WTM manual, but unfortunately the only information we have about it is that it relates to the design of the WTM 24. Actually there is little data to be found regarding these tiny S&S Pistols. Despite the fact that we know the dates when the patents were filed and granted, there is still some discussion about when the WTM may have been sold for the first time. The best sources of information for dating purposes are probably the newspapers and catalogues of the era. Der Waffenschmied was a bi-weekly newspaper for the firearms industry. There is not a single word about the WTM in Waffenschmied prior to a brief hint in an advertisement in the 10th November 1924 edition. 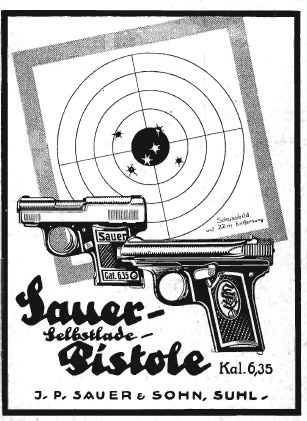 It is the first time the Sauer & Sohn Company mentions a “Westentaschenformat” (vestpocket size) pistol, although the picture in the ad shows only the earlier Model 1919. This might tend to make one think that the gun was not available for sale until sometime in 1924. However, according to Cate and Krause, factory records indicate that the WTM was already being manufactured in mid-1922. The first advertisement we could find that actually shows the WTM is from 25 April 1925 in Der Waffenschmied. 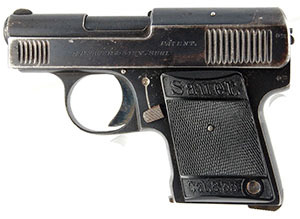 Sauer & Sohn’s first 6.35 mm pistol is referred to in Germany as the Model 1919 and probably appeared on the market late in 1920; this was a downsized version of their 7.65 mm Model 1913 pistol. Sauer & Sohn probably began working on the WTM design almost immediately after putting the Model 1919 into production, possibly as a reaction to the introduction of the Walther Model 9 in 1921. But in the long run (judging from the numbers produced) Sauer’s WTM was not nearly as successful as the Model 1919. Some authors refer to the WTM as the Model 20 (WTM 20), while others use WTM 24 to distinguish it from the later models. It is unlikely the gun was sold prior to the submission of the patent on 21 October 1922, and we are unable to locate advertisements for the gun earlier than November of 1924. Therefore, we believe the WTM 24 designation is preferable. Like the Walther Model 9, the WTM 24 has a fixed barrel and a top- mounted ejector, but instead of using an open-top slide like the Walther, the WTM slide is open for only half its length, leaving room for the shell casing to be ejected when the slide is retracted. Also like the Walther, the connector bar runs under the right grip. The WTM connector is of rather complex construction, consisting of at least four separate pieces of metal pinned together. A flat spring tensions a vertical lever which pivots on the horizontal portion of the bar; this lever fits into a roughly triangular depression milled into the right side of the frame; it and the spring together serve to tension the trigger. A projection at the rear of the connector serves as a disconnector when the slide is out of battery. Unlike the Walther, the WTM 24 design is characterized by a breech block that is separate from the slide, similar to the design of the earlier S&S Model 1913-1930 pistols. A button in the bottom rear corner of the grip plate, tensioned by the magazine release spring, holds the grip plates in position and allows for their removal without tools, whereas the Walther requires a special tool to remove its grip plates. The safety is a lever on the left side of the gun, running under the left grip plate, which locks the sear. Unlike the Walther, the Sauer safety is engaged in the up position and disengaged in the down position. The WTM 24 recoil spring is held captive by a full-length guide rod. Because of the design of the removeable breech block, the recoil spring need not be fully compressed during disassembly. The WTM 24 has a magazine capacity of 6 rounds. The bottom of the magazine is marked “S&S 6,35.W.T.M.” in upper-case serif characters. There is no magazine safety. On the fore end of the slide and at the rear the gun features plunge-milled vertical slide serrations. The Sauer & Sohn caveman trademark is stamped on the rear of the grip tang. The left-side slide inscription reads “PATENT. / J.P.SAUER & SOHN, SUHL”, in upper-case serif italic characters. The right-side slide inscription reads “CAL. 6,35. PATENT”. The serial number is located on the right side of the frame, behind the grip plate. The serial number range is from 1 to approximately 8140. Like the Walther Model 9, the WTM 24 can be disassembled without any tools, and the slide can be retracted even with the safety lever engaged. So a round can be chambered or ejected without fear of the trigger being activated. A pin which protrudes at the rear of the slide serves as a cocking indicator. The end of a small lever protrudes from the back of the WTM; it is used to disassemble the gun (see below). The WTM is slightly larger overall than the Walther. Remove the magazine. Make sure that the gun is unloaded and uncocked. Press the safety lever up with your right thumb while pushing the slide back with your left hand. At about 15 mm you will be able to press the safety lever up into a detente in the bottom of the slide, locking it open. Depress the small lever at the rear of the slide. This will release the breech block and allow it to slide forward. The breech block, firing pin, two springs, and the disassembly lever can be slid forward and removed. These tiny parts can be easily lost, so be careful to collect them all. Push the safety lever down and allow the slide to move forward. When the slide is all the way forward, lift it up off the frame. The recoil spring remains captive in the frame, and there is no need to remove it. In 1928 Sauer & Sohn introduced a new WTM which was named Model 28. The thrust of the new design was to simplify manufacture and thereby reduce production costs. The WTM 28 is 6mm shorter than its predecessor, not as tall or as thick, and 40 grams (1.4 ounces) lighter than the WTM 24. It is nearly identidal in size to the Walther Model 9. 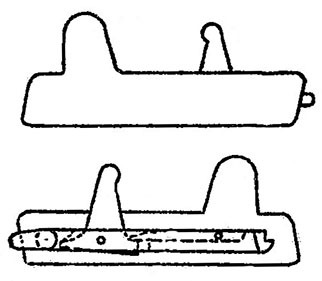 The new design reduced the number of small parts that could fall out of the gun when it was disassembled, but required S&S to invent a new method of locking the slide to the frame. The cocking indicator pin is eliminated, as is the button to hold the grip plates and the full-length recoil spring guide rod. The grip plates on the WTM 28 are held in place by a screw in the center. The new design also incorporates a magazine safety. The connector bar has been simplified by eliminating the flat spring and vertical lever. Instead, a coil spring is used, which fits under the right grip plate. The connector has a cut into which one end of the coil spring fits, and another cut which allows the magazine safety to lock the connector and prevent the gun from being fired when the magazine is out of the gun. The magazine safety consists of a piece of spring metal which is pushed up and out of the cut in the connector bar when the magazine is inserted. The right grip plate has recesses on its reverse to accommodate both the magazine safety and the connector bar spring. The left-side slide inscription reads “J.P.SAUER & SOHN, SUHL”, in upper-case serif italic characters. The right-side slide inscription reads “CAL.6,35 - D.R.P. 453654” in upper-case serif italic characters, reflecting the 1927 patent number. 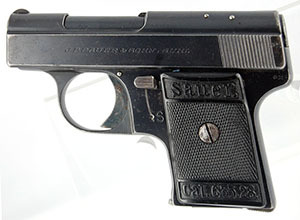 The grip plates are hard rubber, or possibly plastic, checkered, with the word “Sauer.” at the top and “CAL.6,35.28” at the bottom, the “28” being the model number of the gun. The magazine is marked identically to the WTM 24, but magazines are not interchangeable between guns. Other pistols of the time were much more successful. However the Model 28 was a good product and was built in slightly larger numbers than the WTM 24--an estimated 10,000 were built. The WTM 28 was for sale up until about 1939 and cost 27.50 "Reichsmark". At the same time a Behördenmodel cost 40 Reichsmark and a Model 1930 cost 35 Reichsmark. Two variants of the WTM 28 are known. Whereas the first variant was numbered in a serial number block following the WTM 24, the second variant of the WTM 28 now starts in a new series beginning at 250,001 to approx. 252,900. The second variant has only minor differences compared to the first variant: the knob of the safety lever is round with concentric circles and the notch at the back end of the slide now has a crosswise slot, which is intended to aid in disassembly. The last model of Sauer & Sohn’s vestpocket series is the WTM 33. The serial numbers go from 253,001 to approximately 254,300, with serial number 254,255 being the highest number known. This model is the rarest of the Sauer & Sohn’s vest pocket models, as there are only about 1300 known to have been built. The nomenclature WTM 33 comes from Sauer & Sohn itself, as catalogues of that time show. The WTM 33 is not a totally new construction. Compared to the WTM 28, changes are relatively minor. However, the look is a bit different because the gun now has a fully-enclosed slide, with an ejection port and extractor on the right side. The trigger bar has been further simplified, and the coil spring beneath the grip eliminated. The trigger bar is now tensioned by an extension of the same spring that tensions the magazine release. The magazine safety is identical to the WTM 28, as is the method of disassembly. The safety lever is identical to that of the WTM 28 second variant, with a round button with concentric circles. The left-side slide inscription reads “J.P.SAUER & SOHN, SUHL”, in upper-case serif italic characters. The right-side slide inscription reads “CAL.6,35 - D.R.P. 453654”, also in upper-case serif italic characters. The WTM 33 continues to use the WTM 28 grip plates. The magazine is identical to and interchangeable with that of the WTM 28. We do not know why the WTM pistols were not more successful, with probably less than 20,000 total made. 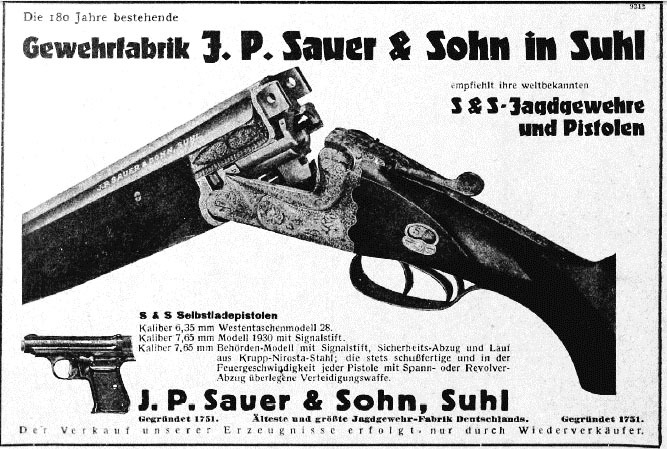 During the same period that the WTM was made, Sauer & Sohn sold many thousands of shotguns and other pistols. In looking at the remaining advertising, it seems that Sauer may have promoted their other products more than the WTM. Pull the slide back most of the way to the rear. Ease the safety upwards, locking the slide back. Push in the circular piece at the back of the slide and rotate counter clockwise approximately 45 degrees. When the piece releases it can be pulled out. Lower the safety and remove the slide by pulling it all the way back and lifting upward. TILLIG, H.J., “Sauer & Sohn Pistolen 1900-1945,” Deutsches Waffenjournal, pp. 36-42, January 1983.